I’ve recently fielded questions from shocked individuals who have been videotaped in friends homes, or out with friends, without being asked or notified. These videos capture conversations and actions they thought were private. While it did not surprise me that some teens behave this way, I was appalled to discover how many adults are facing this issue. Most of those who contacted me weren’t out in public, they were invited guests to dinner parties, or attending private gatherings in homes or backyards. In some cases, the victims had no idea anything was being captured, in others they knew the host was walking around with a camera taking photos – which they were ok with – but didn’t know the camera was also being used to videotape and record conversations of guests. 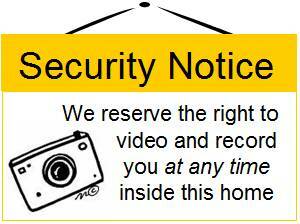 When confronted, these hosts said they were just ‘having fun’ or ‘capturing memories’, and insisted they have the right to take pictures, video, or record anyone who comes into their homes, or friends when they are out together. They justified taking stealth videos by saying that informing friends would prevent people from acting naturally. Gee, if they believe their guests would act differently, could it be because the guests would not want to be videoed or recorded? I’m not talking about filming drunken brawls, or salacious conversations. You don’t have to have something to hide to want your privacy respected, and to control who hears what you have to say and when they hear it. No one really wants their life to be ‘an open book’, most of your conversations and actions aren’t things you would want documented or broadcast – about your diet and weight, or finances, or family troubles, or any number of other topics we share with friends. I have been asked to give an answer about the legality of this behavior. I can’t. I am not a lawyer, but turning to a lawyer for advice, I’m told that these actions are clearly illegal in at least some states. What I will say is, if your privacy and wishes have been disregarded to the point you are asking questions about legality, it’s time to evaluate your choices. My advice? Reconsider your friendship; this is not how real friends behave. Friends respect you when they invite you into their homes, and they take care to ensure you can feel at ease. Friends respect the privacy of your conversations even when you’re out in a public place. At a minimum, friends announce, or make it obvious they are taking photos or videos, ideally they ask permission before doing so. Friends do NOT record conversations that were meant only for the ears of those present at that moment, or videotape behaviors that would not flatter or maintain the privacy of the individual being filmed. Friends do not hold friends hostage by keeping video/recordings that could, should they choose, get posted online, shared out of context – or shared at all. The digital age brings so many benefits – including the benefits of recording life’s moments, staying closer, and being connected. But it also brings a greater responsibility – to act ethically, to respect the privacy and boundaries of others, and to be very transparent about any actions we take that could have an impact on others. This should have been a lesson that only youth need help with. Apparently, it’s not. If you’re an offender, quit trampling your friends privacy and dignity, and show a little respect. If you can’t manage to summon this level of decency, at least hang a surveillance warning by your front door – and set aside funds to cover a lawsuit. This entry was posted on Friday, April 9th, 2010 at 10:11 am and is filed under Linda's Blog. You can follow any responses to this entry through the RSS 2.0 feed. Both comments and pings are currently closed.